Like any other object that has mass, water too follows the law of gravity. 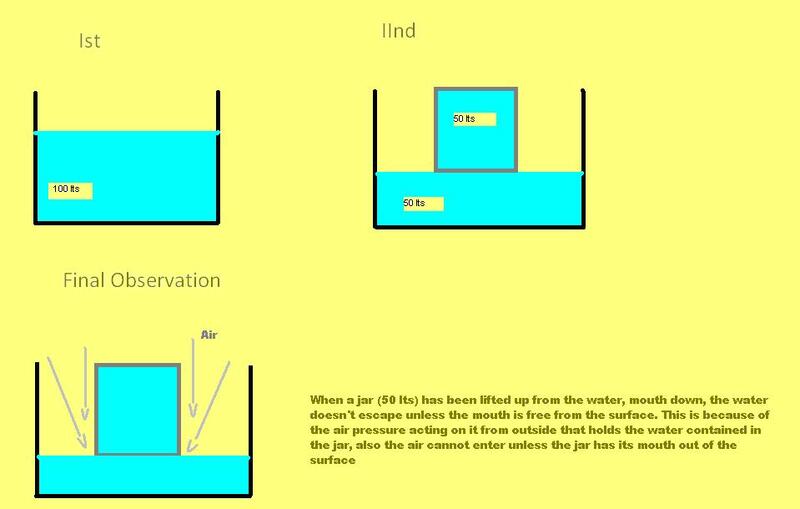 But water can be made to defy gravity under induced conditions. Take for example, inverting a tumbler full of water with a light cardboard covering its mouth. The air pressure outside the tumbler over the cardboard, prevents the water from obeying the laws of gravity as the fluid is held only by a light cardboard balanced by external air-pressure. The same effect can be created with a bucket of water and inverting a mug full of water over it (it’s mouth immersed in the bucket of water). The water in the mug does not pour in to the bucket. While in the bathroom (it is the only space where mind works free for most of us), I happened to observe something that I’ve seen lots of times before and this time I drew a corollary. This anti-gravity does work like money supply and money demand. Imitate the water with money. Take $100 for 100 people. Each get a dollar. Now this is the situation somewhat like socialism. Everyone is economically equal. Now lets create some real world conditions here. A capitalist society or even a mixed economy, for that matter, so that money is “partial” in acquisition. Look into the picture below. The ideal situation can be created by entrepreneurial setup by the bottom 80. Raising the demand for money is the way out and the demand can be created by introducing new competitors in a saturated market at disequilibrium to resurrect an economy based on elastic competition where demand for money = supply of money on both the sides of the population. So to break the chain the demand should be raised and healthy competition should be developed. Is Innovation the Way out? You folks are pretty insightful. That is a good skill to own. Obviously I am unaware of local and personal conditions. I do know however, that some businesses require very little capital, close to none for some, and for ones that do need some start-up capital, there are ways to get it. For example kickstarter and its kin. Failing that, family friends and others that each could afford a little. 10 people with $100 can start more than a few kinds of businesses. Local laws may influence the choice of structures. Partnerships probably don’t work. Limited partnerships and corporations are better. My blog Tuesday the 26th is about Ron Wayne. It shows the problem albeit in retrospect. You will need a business plan. As much for yourself as for the others. Complexity is easy to overlook when the “idea” is so big as to dominate. Better to discover that the devil is in the details before you are far down the road. Maybe include a detail person in the early going. If you want a business plan template email me at don.s@protectorsgroup.com Keep stretching for more. Thank you, Don. This was really helpful. I just read your interesting post about Ronald Wayne and yes, we can all agree he was an uncommon man.. While physics is an exact science whose theories can be tested using math and proven by observation economics is a Pseudo Science which has more in common with fortune telling then reality. Allen Keynes’s economic model and theories have proven to be far more accurate than the conservative model promoted by Milton Friedman whose theories have failed the practical test of reality time and time again. The simple cold hard fact is if enough people don’t have the money to spend – no matter what the reason – then the economy will go into recession just as water will stop flowing when the well dries up no matter how deep into the ground it descends. Businesses that horde money during a recession instead of investing by hiring and seeking to create a demand for their products and services; are their own worse enemy and the primary cause of their own financial misfortune as well as put the cart before the horse by waiting until people start spending money again. And it’s also true what you wrote about Economics being a pseudo -science. I believe it heavily draws it’s elements from Psychology and other behavioural sciences, Life sciences, Physics and Mathematics..
And ultimately, it’s implementation becomes an ‘art’. There is a problem when business behaviour is treated as an economic event. Business behaviour tends to be governed by incentives and disincentives. Presently, in the US, there are disincentives to invest. Uncertainty of government actions primarily, and few if any incentives. Consequently, following the idea that money is analogous to potential energy as discussed, it remains on the shelf. Once there is a reason to make it more dynamic it will appear. Most businesses are aware that non-investment reduces consumption. However, they still keep their potential investments intact because they see the risk of investing to be greater than the risk of not investing. Business and economics are not the same and are only superficially related to each other. Economics is the study of how people allocate scarce resources among themselves. In capitalism, resources are allocated to those who are able to pay. (Pay is actually trade. I exchange my services for money and then exchange the money for for the goods or services I wish to own) In socialism goods are confiscated and are allocated by fiat of a government or similar agency. Most western societies live somewhere between the extremes. Once one realizes that the study of allocation systems is a viable subject, then there needs to be a way to formalize it. Sadly in economics, the formalizing is based on statistically derived models. Again sadly, most of the models are more a reflection of the modelers beliefs than they are of objective reality. There is a belief that smart economists model, average economists study statistics and dumb economists study reality. Most of the trouble today stems from the fact that economic beliefs tend to be ideologically based. Good discussion. Thanks for letting me participate. “Most of the trouble today stems from the fact that economic beliefs tend to be ideologically based.” So I guess it comes down to the fact that if businesses are based on staunch economic models that are based on ideologies, then all we get are businesses acting as charitable institutes?! So here the viable solution seems to be to ditch the models and the stats and do what you feel is best for u in the long run, even if it is hoarding the money. Its pretty much what Ronald Wayne did (made a decision that seemed best at that point of time:: “Are u smart enough to know the future”). An interesting analogy. You might need to consider that money is not a value in and of itself. People who want just money are mentally ill. It is more appropriately like potential energy. No work (value) until it moves (does something). As a result it is easier to believe that there is a demand for what money does or will do. Money is stored potential for something you want or need. In that light, the demand for money is subject to diminishing returns. While I might value one Porsche, I would likely value the second one less. It would be hard to value my marginal desire for any Porsche as even slightly equivalent to my desire for food or medicine or shelter or safety. In businesses, the ones that are created solely to get money almost universally fail. The ones that create value for others primarily in exchange for money secondarily do better. The unpleasant reality though is that most of the Maslovian low level needs must be satisfied before one can adopt this approach. Business have many resources. Some money, some skill, some time, some energy, some relationship skills. In terms of policy, and for the people who can benefit from an entrepreneurial life, partnerships of people with a money and neither time nor energy can work when coupled with someone with time energy and no money. It is hard to do everything alone. Steve Jobs had Steve Wozniak. Bill Gates had Paul Allen. warren Buffet has Charlie Munger. Your piece is a good place to start. Thanks for bringing it up. First of all, thank you for this interesting explanation. Secondly, “It is hard to do everything alone.” is perhaps the greatest truth in the world. Though people living in some societies might feel it more than others. For example, it sometimes comes downright to be having to figure out how to plan your basic finances and your business/entrepreneurial plans may have to take a back seat (for some this does not even come to be) even if you are an individual with talent, vision and have no money or resources. Unless you are lucky to be able to find a partner/mentor and mutually benefit for the interaction, you will pretty much be ignored by the society at large. Furthermore, it also comes down to what your business plans are; how much value it generates for the individual and the society at large (as you said, businesses based on the sole intent of making money almost always fail). And as for the vitality of value creation/ coming up with something really innovative reverberates to the value in terms of money we attach to it. And I also believe you mentioned something about the law of diminishing marginal utility (I had come across this in my high school Economics lesson), that’s how the society will value the inventiveness of a product you create or it might also deter a person from taking great pains to create value based commodity when his basic needs are met handsomely. I hope the writer of this post, Mikky, will agree to what I wrote.